divisions. There are total 449 vacancies available in this Hingoli Police Patil recruitment notification 2017. Eligible candidates may apply for the above vacancies through online from 6th December-2017 to 20th December-2017. Application forms available at www.hingoli.nic.in. Hingoli division Police Patil recruitment Notification has released on 06-12-2017. Last date to send application forms with necessary document is 20/12/2017. Applicant must have maximum age limit below 45 years. Selection for this Police Patil vacancies in Hingoli division Police Patil recruitment is based on candidate merit performance in written examination and Interview. 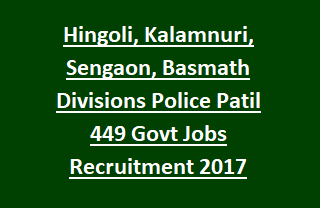 For more information regarding Hingoli, Kalamnuri, Sengaon, Basmath Police Patil 449 govt Jobs Recruitment Application procedure instructions, Method of Selection, Age limits, Pay Scale, Educational qualifications are mentioned below. Total available vacancies in Hingoli Police Patil Recruitment Notification are 449 posts. Post Name: Police Patil: 449 posts. Job Location: Hingoli, Kalamnuri, Sengaon, Basmath. - Hingoli Division: 86 posts. - Kalamnuri Division: 86 posts. - Sengaon Division: 89 posts. - Basmath Division: 188 posts. Please check the official advertisement for more qualification details. Age relaxations admissible for reserved candidates as per rules. Check the advertisement for Pay scale related details. For application fee related details see the notification. Candidates will be selected for Hingoli Police Patil recruitment vacancies based on their merit score in written examination and Interview. See the below given notification for other selection process details. Candidates with required criteria have to go through the official website www.hingoli.nic.in. Read the instructions from the Hingoli Police Patil official notification. Fill the application and submit online application forms from 06-12-2017. Last date to send application forms is 20th December-2017.